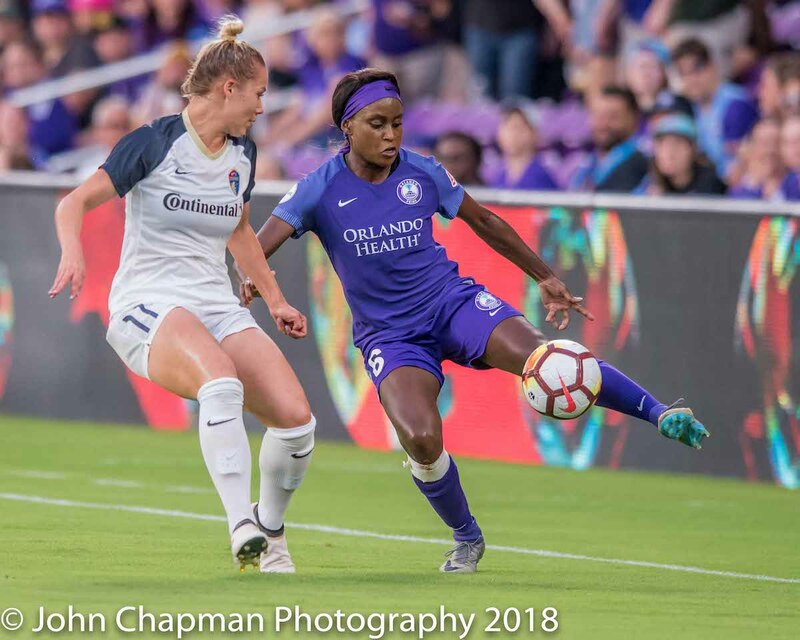 Orlando, FL – In its first home match in nearly a month, Orlando Pride (3-3-3, 12 points) erased a two-goal deficit but fell on a late goal by the North Carolina Courage (8-0-2, 26 points) on Wednesday at Orlando City Stadium. Marta had two assists while Chioma Ubogagu, Alanna Kennedy and Rachel Hill scored. In a seven-goal affair, the Courage scored the lone goal of the first half after Jessica McDonald broke through on a scramble inside the 18 in the 32nd minute. Ubogagu, however, leveled the match with her team-leading fourth goal of the season just seven minutes into the second half. Finding time and space on the left side of the field, Marta directed Ubogagu to a near-post run where the forward was able to beat Courage goalkeeper Katelyn Rowland and sneak the ball into the closed side. The Courage responded with back-to-back goals in the 57th and 62nd minute, with the latter coming off an unfortunate shot off the post that deflected off of goalkeeper Ashlyn Harris and in. The Pride clawed their way back to make it 3-3, with Kennedy netting her first goal of the season, a header off of Christine Nairn’s corner kick. Then in the 83rd minute, second-half substitute Hill drew the game level, slamming home a cross from Marta just eight minutes into her appearance. McDonald found her second goal of the game in the 90th minute, the deciding score. The loss marked the first home defeat for the Pride since July 1, 2017, snapping a 10-game unbeaten streak at Orlando City Stadium. With Wednesday’s match marking the Pride’s lone home game of the month of May, Orlando returns to the road in just three days, traveling to face the Chicago Red Stars on Saturday at 3:30 p.m. ET. The match will be the second time the Pride face Chicago at Toyota Park in less than a month after picking up a 2-0 win on May 2. Known as EdLose or EddyWins depending on the streak. One of the founding members of the Lemonsiders. World traveler and a walking database of unnecessary, useless sports information. I’m the cynical calming voice of reason on the show. I’m a creator of great things. Co-host and creative guru of Lemon City. I dish out the hot sports take on a daily, ask Hipster Rick. I LOVE uniforms and am a collector of vintage baseball caps.